Hand painted wall tiles in your bathroom and kitchen are simple and modern interior decorating ideas for making an immediate visual impact. Unique wall tile designs are a way to make a strong statement and give your bathroom or kitchen decor an artistic touch. Decorative painting turns plain ceramic wall tiles into mini masterpieces, offering charming and creative additions to your beautiful bathroom or kitchen decor. Hand painted tile designs turn dated wall tiles into eye catching, unique and modern wall decoration. If you like the uniformity of tile designs select bathroom and kitchen tiles or painting patterns for your old wall tiles that will bring rhythm and repetition into your rooms. If you decide to buy new modern wall tiles for your bathroom or kitchen decorating, just remember that hand painted wall tiles with geometrical patterns and uniform motifs will fit together almost seamlessly, adding classic look to your customized bathroom or kitchen decor. For creating a quick and easy painting pattern, dip a whisk broom into the paint, approved for bathroom and kitchen tiles, and do a check mark, short stripes or an arch patterns, leaves, berries or simple flowers here and there, spreading color and surprising accents across your wall tiles. Another simple idea is to use a string mop to throw paint spatters onto the wall tiles, creating fresh look. Also you can use more than one color at the same time for adding colorful or monochromatic tile designs with the shades of your favorite colors and making your bathroom or kitchen tiles look more interesting and cheerful. Replacing old bathroom and kitchen tiles are not simple projects. Painting wall tiles is less expensive than buying hand painted tiles and replacing existing tiles with new ones. If some problems are found under old wall tiles, you can spend much more money on your bathroom or kitchen decorating. Also painting ceramic wall tiles allows you to create a customized look for your bathroom or kitchen decor. Hand painting gives you flexibility to decorate your rooms with your favorite colors and wall tile designs. 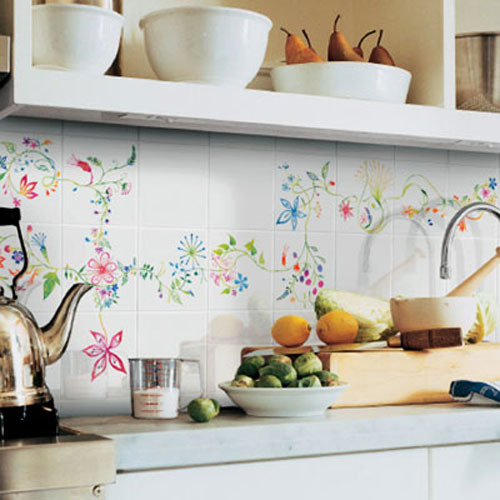 Modern wall stickers and painting are great ways to refresh your bathroom and kitchen tiles. When you want to create new wall tile designs again, you remove wall stickers or change the color and design details by re-painting your bathroom and kitchen tiles, having fun and saving money on interior decorating.